Amazon’s first Amazon Go, a kind of grocery store without cashiers or a checkout line, will open to the public in Seattle on Monday in the first stage of an experiment that could usher in a new era of shopping. Go uses a network of cameras and sensors to dynamically monitor customers and automatically bill them for what they take out of the store via a smartphone app. It’s been in a form of beta testing for some time, but starting tomorrow, any customer will be able to just walk right in if they download and install the Amazon Go app. When we last saw this tech tested out in early 2017, Amazon was reportedly still working on some bugs—like the computers that run the store wigging out if too many customers entered the building, or they moved too fast inside the building, or if retail items got moved around on the shelves. These are things that happen in pretty much every store, so hopefully Amazon has solved the problem. “Amazon, famous for dynamic pricing online, has printed price tags just as traditional brick-and-mortar stores do,” Reuters added—probably because in-store dynamic or personalized pricing could run into a legal grey area. Recode got to visit the 1,800-square-foot store and take pictures; the interior looks a lot like a Whole Foods or other high-end grocery store, though primarily stocked with lunches, snack foods, meal kits, drinks, and other processed items rather than fresh ingredients. Customers are continuously monitored by dozens of square, black cameras mounted on the ceilings. Curiously, wine is also offered behind a sign that says “We Check ID,” though it’s unclear whether that process involves an actual staffer. It’s an interesting concept, but as we noted all the way back in 2016, it carries some uncomfortable implications like implicit classism—if you don’t have a fancy phone you can’t shop there. There’s also the possibility cashier-free stores could threaten an entire sector of employment throughout the economy, though retail has already been struggling to compete against e-commerce for quite some time. 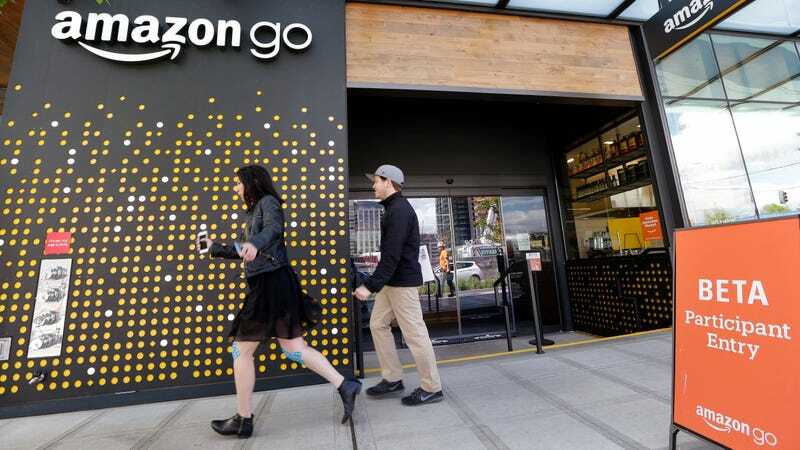 Whether Amazon’s experiment could ultimately lead to Go-like stores dominating the IRL retail market anytime soon is also unclear, because it’s gotten mixed results in its more traditional efforts to breach the brick-and-mortar sector so far. While the e-commerce giant bought Whole Foods for $13.7 billion last year, the Austin Business Journal reports that its efforts to streamline processes and tightly control pricing have cut food waste but worried store managers who say it’s led to product shortages and empty shelves in some stores around the country.